Common Names: stumpknocker (southern coastal plain), hardhead, ringeye. 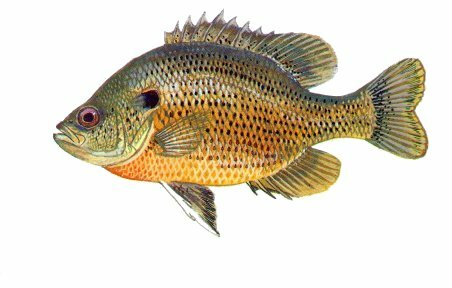 Preferred Habitat: Spotted sunfish are generally found in small rivers or streams. They are commonly found in sluggish creeks containing heavy wood and plant cover. Common size: 4-5 inches, 3 ounces. Spawning: Spawning activity occurs in the early summer when water temperatures reach 70° F. They build nests in very shallow water, and are generally solitary nesters. Courting males make a grunting sound and are very pugnacious when guarding their nests. Miscellaneous: Spotted sunfish are commonly called "stumpknockers" probably due to their feeding activity for insects attached to submersed logs. This species is tolerant of higher salinities than other sunfishes, thus allowing it to exist in coastal streams with some saltwater intrusion.